Like any other war, there's an arms race in the battle between Mexico's drug cartels and the innocents among them. 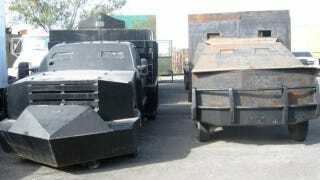 The cartels made tanks – "monstros" or monsters – and now a band of vigilantes have followed suit, complete with armor, turrets, and machine gun slots. Looking like something out of a post-apocalyptic hellscape, these DIY machines – made out of Chevy Suburbans and Ford pick-ups – are fortified with massive slabs of metal armor, makeshift turrets, and battering rams. They've even bolted large trenches to fill with sand, providing an extra layer of protection, without the extra weight of steel. The first improvised fighting vehicles were made by the notoriously bloodthirsty Zetas cartel, headed by former soldiers who defected to the drug gangs. Combating marines, federal police, and other cartels, they created customized trucks known as "monstros," or monsters, that could withstand machine-gun fire and grenades. Security forces hit hard against the Zetas and now have more than 40 of these monsters held at an army base in Reynosa, south of Texas. Others still lurk on dirt roads, with one used to attack a hotel in the border town of Ciudad Mier in April. Farther southwest in Michoacan state, vigilantes fighting the Knights Templar cartel this year followed the lead to build their own trucks for battle. "We were going into heavy gunfire and we needed protection. So we made these monsters of our own, based on the vehicles that the Zetas had built," says Francisco Espinosa, a 26-year-old cattle rancher who fought among the vigilantes. Earlier this year, the Mexican government deputized some of the groups into the Rural State Force, outfitting them with proper vehicles, but they're keeping their homebuilt tanks just in case.